I love quotes. I collect them in a folder on my laptop and love to use them in posts on my Facebook Page, (which by the way I encourage to to look over and “Like” so you will get occasional entries. Anyway I saw this one today and it is SO applicable to nurses who sit on the sideline and dream their life away instead of jumping in and seeing if it is for them. Napoleon Hill is credited with this quote. He was a well known motivational author in the early 20th century and his books have sold in the tens of millions. 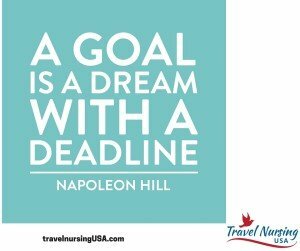 The gist of this great quote is to take your dream (say looking into travel nursing), set a deadline of doing it (you could start HERE) and then following up on your GOAL.